This package can display the time in different time zones. 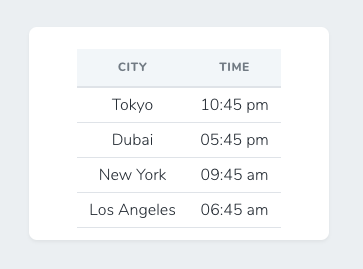 It provides a card to use in Laravel applications that shows on a Web page the current time in one or more world time zones. The list of time zones that it takes displays the time is configurable by passing an array with the names of those time zones. Add a different format to the constructor, see http://php.net/manual/en/function.date.php for available formatting options.